Twenty-eight years ago, Chris Walker joined the Local 32 union to become a Steam Fitter. beliefs aligned well with Hermanson’s core values and company philosophy, so it was an obvious choice. Chris has constructed eight commercial high-rise buildings in his career, most notably the University of Washington Molecular Science building and the AMLI/TILT49 project. The UW building was a challenging project, as it had twelve different mechanical systems. Since its completion, the University of Washington offers paid tours of the building to interested engineers. His first project as a Hermanson Foreman The AMLI/TILT49 project was also very complex, as the project required two high-rise towers to be constructed concurrently. “Being entrusted by Hermanson management to simultaneously run two buildings at the same time was an honor. The project was a remarkable success and was awarded Job of the Year at Hermanson’s annual meeting. I am extremely proud to have been a part of it,” says Walker. Although originally from San Diego, Chris was raised in Seattle where he played state championships in both track and basketball, setting two state records in track. From high school, he played basketball around the world after joining the United States Navy. He went on to coach basketball - both Youth AAU and Men’s Pro-AM. Chris has always committed himself to a lifestyle of exercise and fitness, but after three knee surgeries, he has narrowed his activities to golf and bowling. He is a career 200+ average bowler and he enjoys year-round golfing and bowling with his wife, Adelene (“Addie”). Addie and Chris have three grown children: Catherine, Jorell, and Nathan. His oldest son is currently serving in Korea with the United States Marine Corps and his younger two are both graduates of the University of Washington. 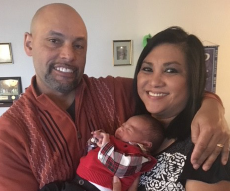 Last year, Chris and Addie celebrated the birth of their first grandchild, Avianna. In his personal life, his biggest passion is serving God and serving in the church and sharing his faith. Chris’s commitment to his family, faith, and values make him an exceptional foreman. Thank you, Chris, for being part of the Hermanson Team!